Swimmers and parents associated with the Boys and Girls Blue Wave Swim and Dive Teams spoke at a public Board of Education meeting in January. The board had proposed cuts to the team’s budget that could prove detrimental and the swimmers and divers were trying to keep their funding sufficient. The swim and dive teams already have incredibly low funding per pupil. Most of the funding comes from parents and fundraisers. The McNamara proposal was part of the newest budget plan for Darien Public Schools and would cut the team’s already modest funding. This would be justified by splitting the “swim” and “dive” accounts. By taking them as two separate entities, the board thought it could justify the cuts. The swimmers and parents emphasized that the teams worked as a unit and the diving team would fizzle out if the costs were cut. This would happen due to the standard of the diving team going down and simply not being as good as other options for divers, such as their normal team. The cost of diving is rather high per participant but swimming is very low, thus making the combined unit cost-effective. The splitting of accounts was a see-through plan to try and cut the funding to one of the lesser celebrated teams. The teams were not lacking in results as the boys team had won state championships the prior year. While giving his speech to the board, senior Nick Giotis said that,“When you’re looking at per student cost. . . It is actually less than a number of teams at the high school: baseball, basketball, cheerleading, golf, ice hockey, gymnastics, squash, and wrestling.” Giotis brings up the point that together, swim and dive takes up very little space in the budget. 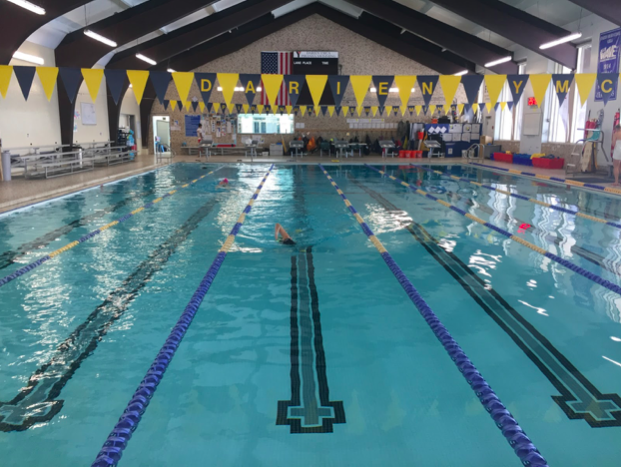 In regards to the justification for the cut, “It seems as though, connected, these two sports, swimming and diving, wouldn’t be as big a burden than if you looked at them separately,” Giotis said. Using the holistic view of the team was what brought Giotis’ speech to a close. He delivered the facts and proved the numbers don’t lie. Senior Connor Zielinski from the swim team felt that “Over the past few years this team has been my rock and such a big factor of my life; it fostered a positive and healthy environment for me.” Bringing up the emotional value of a high school team was a good way to show some genuine emotion to the board. Zielinski kept his speech short but sweet, addressing the board headfirst. “As we have already proven, we are capable of winning championships, evidence is last year’s first place finish at state finals,” pointed out Zielinski. This point was one the boys team was quite fond of making, and for good reason. The team had put in hours and hours of working to bring the Darien logo to the number one spot at states. This seemed to be overlooked by the board when thinking up the budget. One of the strong forces the swim teams had on their side was the fact that parents and swimmers alike were concerned. “I, as a parent, if I have to make that kind of a contribution, am going to have to go elsewhere,” said Brian Stobbie, the father of a sophomore on the boys team and many swimmers on the girls team in years past. The decision as to whether to swim on the high school team or on a private team is ultimately on the parents, making this argument all the more stronger. There were other members of the team and other parents there at the meeting to show support as well.. There were many of the girls team members although they did not speak. Craig and Tory Lovegrove, parents of a junior on the boys team, were there. Junior Cormac Brown was also there to show support for his team. A community builds off of the opinions of the people residing in it. This cut was not the focus of the meeting. Most people had come to talk about the funding required to get another psychologist for the elementary schools to improve mental health at a young age. This important topic took up much of the time, rightfully so. However, if the swimmers had not come and talked, the budget cut to their team would have succeeded. The members of the board voted against the cut and the teams rejoiced the next day. The board decided to treat the swim and dive as one team, just like it had always been. By establishing this combination of the two again, the cut couldn’t be justified. Each person’s voice counts in their community. Their voice matters, especially in a relatively small town like Darien.